One of the most significant changes to occur over the last decade is that Oregonians feel safer. They are less worried about crime in their communities, neighborhoods and parks. But they are more concerned about senior services issues. 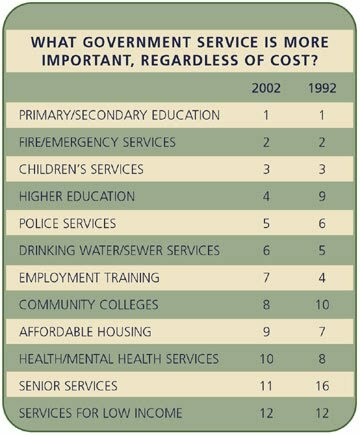 From adequate adult daycare to funding government programs, senior services are moving up the priority list. There also has been a marked change in perception on education. Oregonians think the state is doing a better job providing K-12 education than they did 10 years ago, and they place more priority on higher education. 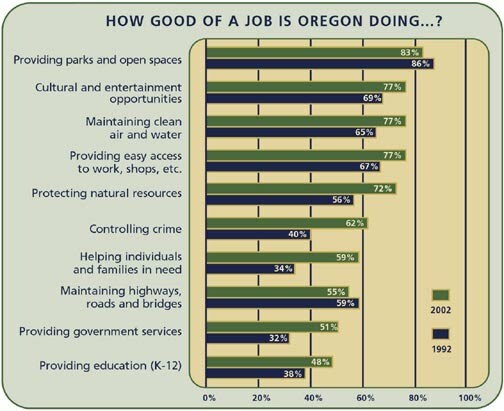 On services from controlling crime to education, Oregonians think the state is doing a much better job today than it was in 1992.